At the website HandsOfRespect.com, you can purchase a pair of lapel pins designed by comic book creator Stan Lee. Each pin depicts a handshake between a black and white hand; above the hands is the word "Respect." Cost: $10. Listen up, True Believer. Here’s how YOU can be a real life superhero! Join me in inspiring RESPECT FOR ALL! I’ve designed this RESPECT PIN! Two hand clasped together under the word “RESPECT,” signifying unity. Isn’t that what America’s all about? With every pin ordered you’ll get one FREE to give to a friend, to help spread our vital message. Nowhere on the website is there any specific indication as to where your ten dollars goes. I wrote to Stan Lee's publicist Jerry Olivarez — who is also listed as the Executive Director of Hands of Respect — and to Dawn Miller, Stan Lee's personal PR agent asking the simple question: "Is Hands of Respect a for-profit or non-profit organization?" Neither replied. Link to names of those "orgs"? And what % of the $ goes to these orgs? Kids are giving you their money — be transparent. Thank you for challenging important questions. The website anticipates reconstruction which will provide full transparency. Kids like these have given you money. Can you name at least one of the "multiple non profit orgs" who you've given it to? The initiative is still in infancy, and is continually building partnerships one is L.E.A.D (Law Enforcement Against Drugs). I contacted L.E.A.D. asking how much money they're received (if any) from the Hands of Respect Initiative. I'll update when/if I receive a reply. 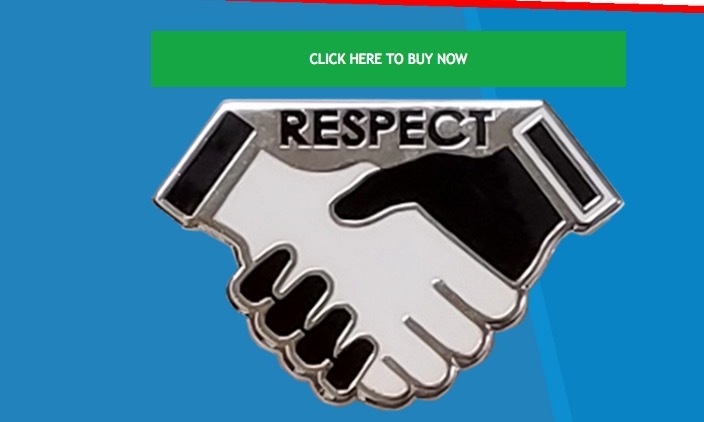 Meantime, on the Hands of Respect website is a link to theStream.tv's "Agents of Marvel" show, where hosts Madison Brunoehler, Clement J Bryant and Tatiana Hullender reveal that many police departments are buying a lot of these pins. Officers will wear them on their lapels. Where do police departments get the money to buy all these pins? That would be your tax dollars at work. @HandsRespect deleted the tweet where they claim to have given money from pin sales to L.E.A.D. That's not a good sign. I checked today, and it does not appear that Hands of Respect is a registered charity in the State of California. Also, it does not appear that Hands of Respect is a registered tax-exempt organization with the IRS. The Concord has not and will not receive any funds from the sales of the hands of Respect lapel pins. I tried getting in touch with Law Enforcement Against Drugs again today — they're the organization that Hands of Respect claimed to be giving Respect pin funds to... in a Tweet that they later deleted. This time I contacted L.E.A.D. through their Facebook page, and to their credit they responded quickly, saying that they "just signed the contract" with Hands of Respect. Hands of Respect has been collecting money from people since at least July. L.E.A.D. also confirmed that so far they have not received any money from Respect pin sales (though they expect to at some point in the future). So when Hands of Respect tweeted (and then deleted) that money from pin sales had been donated to multiple non-profit organizations including L.E.A.D., that wasn't really true. The helpful and forthcoming person at L.E.A.D. also answered the question that Hands of Respect so far has not: "They [Hands of Respect] are a for-profit company." If true, this means although they have partnered with at least one non-profit (L.E.A.D. ), Hands of Respect is not a charity or non-profit. If you buy a pin expecting your money to be used for the stated intent of fostering better relations between the police and the African-American community, that's not necessarily what's going to happen to your ten dollars. If this is true, someone is is going to get rich from all those pins that children and adult Avengers fans are buying at ComiCons and online. Even ickier is the fact that according to the "Agents of Marvel" video on Hands of Respect's website, tax-payer dollars are being used to purchase these pins for police officers. Let's just put it this way — let's say you wanted to make a lot of money. One way to do it would be to create a item like a "Kick Cancer" bracelet and tell people that its purpose was to help fight leukemia. So people buy it thinking that their money was going towards that goal. And then let's say you managed to secure a government contract — getting schools to order thousands of Kick Cancer bracelets to be worn by teachers. If each teacher has to wear one, you could make a lot of money on your Kick Cancer bracelets. And since your organization is a for-profit company, all the money you're getting from ordinary people who bought the Kick Cancer bracelets — and from schools who used tax-payer money to buy them for teachers — well... you can just put most (or even all) of that money right into your pocket. Maybe you tell yourself that just by getting people to wear the Kick Cancer bracelets, you've helped "raise awareness for this important issue." But really what you've done is trick people into giving you money for a cheap piece of jewelry. Is that what's going on here? Hard to say. We don't have a lot of facts, and the ones we do have aren't so great. Hopefully Hands of Respect will become more transparent soon. "In light of recent coverage Hands of Respect has been receiving, we wanted to clarify our organization’s structure, work and ambitions. Hands of Respect LLC is a for-profit company. Yet to date [with no date posted], the company has not made a profit. Stan Lee had a vision he wanted to share with the world, and the LLC structure allowed us to spread his message of unity and respect right away." Have you done any more digging since you made this post, Jonathan? IF YOU WRITE IT BOTH WAYS, IT'S GOTTA BE TRUE!